Growing demand for advanced driver assistance systems (ADAS) and premium audio systems are some factors expected to drive the automotive electronics market size over the forecast period. Automotive electronics are system products involving automobile manufacturing, electronics, optoelectronics, and IT technologies. Key components include passive electronic components, sensors, micro-controllers, power supply devices, microprocessors, driver devices, telecom components and indicators. The components are used across various automotive segments including ADAS, infotainment, safety systems, body electronics and powertrain. The automotive electronics industry procures raw material from various suppliers depending upon the cost, availability and delivery. Strong global demand for certain raw materials has had a significant impact on operating costs, thereby, affecting their profit margins. Raw materials such as resins, copper and aluminum are primarily used in electronic components systems. Automotive electronics manufacturers such as Delphi, Denso Corporation and TRW, utilize these raw materials to manufacture various components such as body control modules, power steering ECUs, instrument clusters, and immobilizers. There are sources of Tier-1 and Tier-2 companies actively contributing to the booming electronics in the automotive industry. These companies are engaged in developing new electronic functions and engineering activities in the vehicles. Development and marketing of new technologies such as electric vehicle, hybrid electric vehicle, and fuel cell products are significantly expected to improve the fuel economy and emissions across various regions. These manufacturers witness high competition for commodities such as DRAM, MCU, NAND flash and sensors from the consumer industry. Security and safety: Predictive and remote diagnostics, active driver assistance systems, tacking, remote failure diagnostics, and access control. For instance, in the EU countries, eCall is a project intended to provide rapid assistance to the drivers in case of any emergency. Energy-efficient drivetrain: Alternative fuels, engines, optimization, vertical innovations and brake energy re-use. For example, Microsoft Hohm is a new energy efficiency website, which helps owners to determine how and when to more affordably recharge their plug-in hybrid vehicles. Comfort: Vehicle-to-infrastructure, vehicle-to-vehicle, interior personalization, next-generation location-based service and navigation, automated toll & payment and integrated tracking management systems. 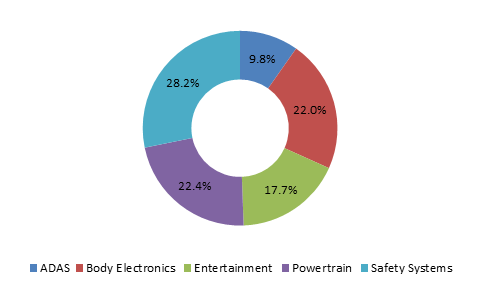 For the interior in-vehicle service segment, innovation in interconnection, sensor detection and driver interface technology will enable growth opportunities for the market. The market is currently witnessing a significant number of consolidated CE technology providers entering into the automotive electronics market.